Most often Howard Shope sits by the big picture window of his home in his gray corduroy swivel rocker while waving, watching or waking up from his "deep thoughts." Howard misses the past vistas that progress has taken away from this legendary Mr. Handyman turned neighborhood watchman and observer. Before the recent construction projects, he used to watch the high school football games from his own cozy window. The obvious home advantages were many, especially on cold and rainy game nights while he was sitting by the fire, eating warm apple pie and reclining in his swivel chair front row seat. One day recently, there was a much smaller face sharing the big picture window view and his grandfather's German heritage. 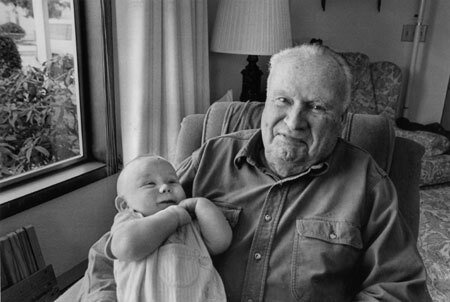 Cradled in Howard's arm was his great grandson Kolton, who at only 4 months old has already developed a contagious personality that makes even his usually stoic grandpa grin.